Our packaging materials can retain the products' quality and newness even under extreme shipping and handling conditions. Our packaging provides optimum physical protection. In order to keep our offerings in safe and secure conditions, we have developed a storage unit and keep it updated with the defined industry standards. Details : Coversyl (trade names Coversyl, ) is a long-acting ACE inhibitor. 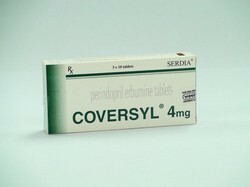 Coversyl is used for patients with stable coronary artery disease to reduce the risk of cardiovascular mortality or nonfatal myocardial infarction.